Today, I realized that this first week of February is completely full of holidays! And I love it. First it was Groundhog Day. Then it was Chinese New Year. Next on Sunday is will be the Super Bowl. Sure, it’s not technically a holiday. There are no days off for work (I’ll actually be working part of the day), and no large travel hang-ups across the country caused by too many travellers. But, I know many many people do consider it an annual holiday, and with good reason. Super Bowl gamedays are usually filled with friends, food, and festivities. Plus, the mail is never delivered on the day of the game, so technically it’s just as legit as the real holidays each year. My plans for Sunday are still a bit up in the air, but for those of you hosting a party or heading to a potluck, here are a couple new recipes that are great for a crowd. One is perfect for the meat-eaters, the other is vegetarian (but carnivores also love it). Both are extremely easy to make, which ensures that most of your time will be spent watching funny commercials rather than watching the stove. 1. Empty meatballs into a large crockpot. 2. Pour jelly and chili sauce on top, stir to combine, and set crockpot to low for 4 hours. 3. Stir very occassionally. Make sure the meatballs are completely heated through when done. Curried Chickpea Salad — a dish from my birthday pizza party! 1. In a clean and dry sauce pan, heat the spices (curry through cayenne pepper) over medium heat for 1 to 2 minutes. This intensifies the flavor! 2. In a small bowl, pour spices into olive oil and whisk to combine. 3. 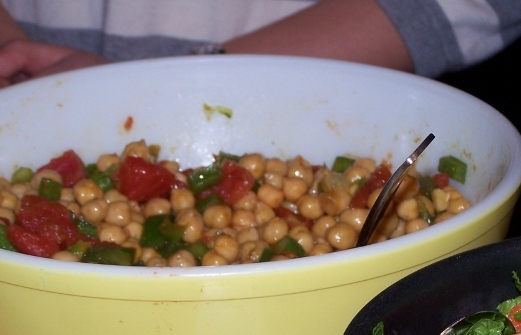 In a large bowl, combine garbanzo beans, bell pepper, and can of half-drained tomatoes. 4. Add olive oil mixture to the beans, and well until everything is combined. Here’s another thing to celebrate: Joie de Meg was featured on FoodPress.com today with my recipe for Fried Egg and Tomato! Very cool. Thanks, FoodPress! Q: What’s the Best Way to Make Phillies Fans Sit Down and Be Quiet?